Malnutrition now impacts 15% of the world population -- more than one billion people. Every year, as many as three million children die from hunger-related causes. Smoking kills more people in the US than murder, AIDS, suicide, drugs, car crashes and alcohol combined. Worldwide one billion deaths are predicted in this century from tobacco. Half of the world population - 3.5 billion people - still live on less than $4 a day. The wealthiest 1% in this world ($110 trillion) now control 65X what the bottom 50% have ($1.7 trillion). We must cut back on things that are not necessary. We then will not need to work as hard to sustain them, and will have money left over to help make this world a better place. Immanuel Kant (1724-1804) was a German philosopher, widely considered to be a central figure of modern philosophy. He argued that human concepts and categories structure our view of the world and its laws, and that reason is the source of morality. Immanuel synthesized early modern rationalism and empiricism, set the terms for much of nineteenth and twentieth century philosophy, and continues to exercise a significant influence today in metaphysics, epistemology, ethics, political philosophy, aesthetics, and other fields. Kant's major work, the Critique of Pure Reason (Kritik der reinen Vernunft, 1781), aimed to bring reason together with experience, and move beyond what he took to be failures of traditional philosophy and metaphysics. He hoped to end an age of speculation, where objects outside experience were seen to support what he saw as futile theories, while resisting the skepticism of thinkers, such as David Hume. Kant was born into an artisan family of modest means. His father was a master harness maker, and, according to Kant, was a descendant of a Scottish immigrant, though scholars have found no basis for this claim. His mother was the daughter of a harness maker, though she was better educated than most women of her social class, and was remarkable for her character and natural intelligence. Kant's family was never destitute, but his father's trade was in decline during Kant's youth, and his parents, at times, had to rely on extended family for financial support. Both his parents were devoted followers of the Pietist branch of the Lutheran church, which taught that religion belongs to the inner life expressed in simplicity and obedience to moral law. Kant attended a Pietist school -- Collegium Fridericianum -- from eight through fifteen years of age. The influence of their pastor made it possible for Kant -- fourth of the nine children, but the eldest surviving child -- to obtain an education. At the age of eight, Kant entered the Pietist school that his pastor directed. This was a Latin school, and it was presumably during the eight and a half years he was there that Kant acquired his lifelong love for the Latin classics, especially for the naturalistic poet Lucretius. In 1740, he enrolled at the University of Königsberg (Albertina), as a theological student, where his early interest in classics was quickly superseded by philosophy, which all first year students studied and which encompassed mathematics and physics, as well as logic, metaphysics, ethics, and natural law. Kant's philosophy professors exposed him to the approach of Christian Wolff (1679-1750), whose critical synthesis of the philosophy of Leibniz (1646-1716) was very influential in German universities. 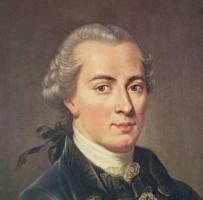 Kant was also exposed to a range of German and British critics of Wolff, and there were strong doses of Aristotelianism and Pietism represented in the philosophy faculty as well. Kant's favorite teacher was Martin Knutzen (1713-1751), a Pietist who was heavily influenced by both Wolff and the English philosopher John Locke (1632-1704). Knutzen introduced Kant to the work of Isaac Newton (1642-1727), whose influence is visible in Kant's first published work, Gedanken von der wahren Schätzung der lebendigen Kräfte (1746; Thoughts on the True Estimation of Living Forces), which was a critical attempt to mediate a dispute in natural philosophy between Leibnizians and Newtonians over the proper measurement of force. Although Kant twice failed to obtain a professorship at Königsberg, he refused to accept offers that would have taken him elsewhere—including that of professor of poetry at Berlin, which would have brought greater prestige. He preferred the peace and quiet of his native city to develop and mature his own philosophy. The fundamental idea of Kant's critical philosophy, especially in his three Critiques -- the Critique of Pure Reason (1781 and 1787), the Critique of Practical Reason (1788), and the Critique of the Power of Judgment (1790) -- is human autonomy. He argues that human understanding is the source of the general laws of nature that structure our experience, and that human reason gives itself the moral law -- the basis for belief in God, freedom, and immortality. Therefore, scientific knowledge, morality, and religious belief are mutually consistent and secure because they all rest on the same foundation of human autonomy, which is also the end of nature, according to the teleological1 worldview of reflecting judgment that Kant introduces to unify the theoretical and practical parts of his philosophical system. Critique of Pure Reason – In accordance with his purpose to examine all knowledge to find what is and what is not a priori, or transcendental—that is anterior to experience, or independent of experience -- Kant proceeds in the "Critique of Pure Reason" to inquire into the a priori forms of (a) sensation, (b) judgment, and (c) reasoning. Sensation – The first thing that Kant did in his study of knowledge was to distinguish between the material, or content, and the form, or sensation. The material of our sense-knowledge comes from experience. The form, however, is not derived through the senses, but is imposed on the material or content by the mind to render the material or content universal and necessary. The form is, therefore, a priori; it is independent of experience. The most important forms of sense-knowledge, the conditions, in fact, of all sensations, are space and time. In such a case, not only are space and time mental entities (in the sense that they are elaborated by the mind out of the data of experience), they are strictly subjective, purely mental, and have no objective entity, except insofar as they are applied to the external world by the mind. Judgment – Taking up knowledge, which we acquire by means of understanding (Verstand), Kant finds that thought in the strict sense begins with judgment. As in the case of sense-knowledge, he distinguishes here between “the content” and “the form.” The content of judgment, or in other words, that which the understanding joins together in the act of judgment, can be nothing but the sense-intuitions, which take place, as has been said, by the imposition of the forms of space and time on the data of sensation. Sometimes, sense-intuitions (subject and predicate) are joined together in a manner that evidently implies contingency and particularity. With regard to these, Kant's first remark is that their necessity and universality must be a priori. Nothing that is universal and necessary can come from experience, which is axiomatic with him. There must, then, be forms of judgment, as there are forms of sensation -- imposed by the understanding -- which do not come from experience at all, but are a priori. These forms of judgment are the categories. The knowledge, therefore, which we acquire by the understanding is confined to the appearances of things, and does not extend to the noumenal2 reality, the Ding-an-Sich. Reasoning – In the third place, Kant's "Critique of Pure Reason" is occupied with the reasoning faculty (Vernunft). Here "ideas" play a role similar to that played in sensation and judgment by space and time and the categories, respectively. 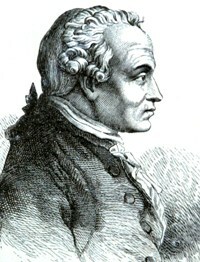 Examining the faculty of reasoning, Kant finds that it has three distinct operations -- namely categorical, hypothetical, and disjunctive reasoning. To these, he says, correspond the three "ideas" -- the idea of the soul as the thinking subject (psychological idea); the idea of matter as the totality of phenomena (cosmological idea); and the idea of God as the supreme condition of all reality (theological idea). He first takes up the idea of the soul, and examines the course of reasoning of the psychologist who teaches the substantiality, immateriality, and immortality of the human soul. He pronounces that line of philosophical thought to be fallacious, as it starts with the false supposition that we can have an intuitive knowledge of the soul as the substantial subject of conscious states. Next, Kant subjects the cosmological idea to a similar analysis. He finds that as soon as we begin to predicate anything concerning the ultimate nature of matter, we fall into a series of contradictions, which he calls antinomies. The conclusion is that by pure reason alone we cannot attain knowledge of the nature of the material universe. Finally, Kant takes up the theological idea -- the idea of God -- and criticizes the methods and arguments of rational theology. According to Kant, the speculative basis of belief in the existence of God is unsound because the proof brought forward to support it is not conclusive. Saint Anselm's ontological argument tries to establish an existential proposition, without reference to experience; it confounds the order of things with the order of ideas. Kant, of course, did not deny the existence of God, and neither did he deny the immortality of the soul or the ultimate reality of matter. Kant’s aim was to show that the three ideas, or, in other words, speculative reasoning concerning the soul, the universe, and God do not add to our knowledge. Although the ideas do not extend our experience, they regulate it. The conclusions of the first "Critique" are the premises of contemporary Agnosticism. We can know nothing except the appearances of things; the senses reach only phenomena; judgment does not go any deeper than the senses, so far as the external world is concerned; science and philosophy utterly fail in the effort to reach the knowledge of substance (noumenon), or essence, and the attempts of metaphysics to teach us what the soul is, what matter is, what God is, have failed and are doomed to inevitable failure. These are Kant’s conclusions in the "Critique of Pure Reason"; they are the assumptions of the Agnostic and of the Neo-Kantian opponent of Scholasticism. Critique of Practical Reason – Kant, it has often been said, tore down in order to build up. What he took away in the first "Critique" he gave back in the second. In the "Critique of Pure Reason" he showed that the truths, which have always been considered the most important in the whole range of human knowledge, have no foundation in metaphysical that is, purely speculative reasoning. In the "Critique of Practical Reasoning," he aims at showing that these truths rest on a solid moral basis, and thus are placed above all speculative contention and the clamor of metaphysical dispute. He has overthrown the imposing edifice, which Cartesian dogmatism had built on the foundation, "I think"; he now sets about to rebuild the temple of truth on the foundation, "I ought." The moral law is supreme. Critique of the Faculty of Judgment – Intermediate between speculative reason -- the faculty of knowledge and practical reason, which is the faculty of voluntary action -- is the faculty that Kant calls judgment, and which is the faculty of aesthetic appreciation. As truth is the object of knowledge, good the object of action, beautiful and purposive are the objects of judgment. By this peculiar use of the word judgment, Kant at once places himself outside the ranks of the sensists, who refer to all the constituents of beauty to sense-perceived qualities. He is an intellectualist in aesthetics, reducing the beautiful to elements of intellectuality. The beautiful, he teaches, is that which universally and necessarily gives disinterested pleasure, without the concept of definite design. It differs, consequently from the agreeable and the useful. However, Kant is careful to remark that the enjoyment of the beautiful is not purely intellectual, as is the satisfaction experienced in contemplating the perfect. The perfect appeals to the intellect alone, while the beautiful also appeals to the emotions and the aesthetic faculty. Evaluation of Kant – Critics and historians do not all agree about Kant's rank among philosophers. Some rate his contributions to philosophy so highly that they consider his doctrines to be the culmination of all that went before him. Others, on the contrary, consider that he made a false start when he assumed in his criticism of speculative reason that whatever is universal and necessary in our knowledge must come from the mind itself, and not from the world of reality outside us. These opponents of Kant, moreover, consider that while he possessed synthetic talent, which enabled him to build a system of thought, he lacked in the analytic quality by which the philosopher observes what actually takes place in the mind. In a thinker, who reduced all philosophy to an examination of knowledge, the lack of the ability to observe what actually takes place in the mind is a serious defect. 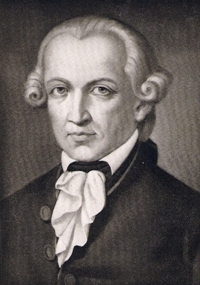 Within the limits of the philosophical sciences themselves, his thought was the starting point for Fichte, Schelling, Hegel, and Schopenhauer; and, so far as contemporary philosophic thought in Germany is concerned, whatever of it is not Kantian, takes for its distinguishing characteristic its opposition to some point of the Kantian doctrine. In England, the Agnostic School from Hamilton to Spencer drew its inspiration from the negative teaching of the Critique of Pure Reason. In France, the Positivism of Comte and the neo-criticism of Renouvier had a similar origin. Kant's influence reached out beyond philosophy into various other departments of thought. In the history of the natural sciences, his name is associated with that of Laplace (1749-1827), in the theory which accounts for the origin of the universe by a natural evolution from primitive cosmic nebula. In theology, his non-dogmatic notion of religion influenced Ritschl, and his method of transforming dogmatic truth into moral inspiration, finds an echo, to say the least, in the exegetical3 experiments of Renan and his followers. Kant’s Tomb and Statue – Kant's tomb is today in a mausoleum adjoining the northeast corner of Königsberg Cathedral in what is now known as Kaliningrad, Russia. The mausoleum was constructed by the architect Friedrich Lahrs and was finished in 1924, in time for the bicentenary of Kant's birth. Originally, Kant was buried inside the cathedral, but in 1880 his remains were moved outside and placed in a neo-Gothic chapel adjoining the northeast corner of the cathedral. Over the years, the chapel became dilapidated before it was demolished to make way for the mausoleum, which was built on the same spot, where it is today. The tomb and its mausoleum are among the few artefacts of German times that are preserved by the Soviets after they conquered and annexed the city. Today, many newlyweds bring flowers to the mausoleum. 2The noumenon is a posited object or event that is known (if at all) without the use of the senses. The term is generally used in contrast with, or in relation to "phenomenon", which refers to anything that appears to, or is an object of, the senses. 3Exegesis is a critical explanation or interpretation of a text, especially a religious text. Traditionally the term was used primarily for exegesis of the Bible; however, in modern usage it has broadened to mean a critical explanation of any text, and the term "biblical exegesis" is used for greater specificity.